Mithraism was an ancient mystery religion prominent from the 1st century BCE to the 5th century CE. It was based on worship of the god Mithras and derives from the Persian and Indic god Mithra and other Zoroastrian deities. Mithraism apparently originated in the Eastern Mediterranean around the first or second centuries BC. It was practiced in the Roman Empire since the first century BC, and reached its apogee around the third through fourth centuries AD, when it was very popular among the Roman soldiers. Mithraism disappeared from overt practice after the Theodosian decree of AD 391 banned all pagan rites, and it apparently became extinct thereafter. Mithraism is best documented in the form it had acquired in the later Roman Empire. It was an initiatory 'mystery religion,' passed from initiate to initiate, like the Eleusinian Mysteries. It was not based on a supernaturally revealed body of scripture, and hence very little written documentary evidence survives. Soldiers appeared to be the most plentiful followers of Mithraism, and women were apparently not allowed to join. It is difficult for scholars to reconstruct the daily workings and beliefs of Mithraism, as the rituals were highly secret and limited to initiated men. Mithras was little more than a name until the massive documentation of Franz Cumont's Texts and Illustrated Monuments Relating to the Mysteries of Mithra was published in 1894-1900, with the first English translation in 1903. However, it is known that the center of the cult was the mithraeum, either an adapted natural cave or cavern, preferably sanctified by previous local religious usage, or an artificial building imitating a cavern. Mithraea were dark and windowless, even if they were not actually in a subterranean space or in a natural cave. When possible, the mithraeum was constructed within or below an existing building. The site of a mithraeum may also be identified by its separate entrance or vestibule, its "cave", called the spelaeum or spelunca, with raised benches along the side walls for the ritual meal, and its sanctuary at the far end, often in a recess, before which the pedestal-like altar stood. Many mithraea that follow this basic plan are scattered over much of the Empire's former area, particularly where the legions were stationed along the frontiers. Others may be recognized by their characteristic layout, even though converted as crypts beneath Christian churches. 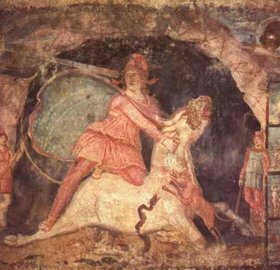 In every Mithraic temple, the place of honor was occupied by a representation of Mithras killing a sacred bull, called a tauroctony. It has been more recently proposed that the tauroctony is a symbolic representation of the constellations rather than an originally Iranian animal sacrifice scene (Ulansey, 1991). Mithras is associated with Perseus, whose constellation is above that of the bull. A serpent, a scorpion, a dog, and a raven are present, also thought to represent associated constellations. However, this later theory has its own problems, as shown by Dr. Shepherd Simpson's "Mithraism and Precession: The Tauroctony and the Celestial Equator". From the structure of the mithraea it is possible to surmise that worshippers would have gathered for a common meal along the reclining couches lining the walls. It is worth noting that most temples could hold only thirty or forty individuals. The new initiate became a Corax, while the Leo was an adept. In the absence of any Mithraist scripture, all we know about Mithras is what can be deduced from his images in the mithraea that have survived. Some depictions show Mithras carrying a rock on his back, much as Atlas did, and/or wearing a cape that had the starry sky as its inside lining. A bronze image of Mithras, emerging from an egg-shaped zodiac ring, found associated with a mithraeum along Hadrian's Wall (now at the University of Newcastle), and an inscription from the city of Rome suggest that Mithras may have been seen as the Orphic creator-god Phanes who emerged from the cosmic egg at the beginning of time, bringing the universe into existence. This view is reinforced by a bas-relief at the Estense Museum in Modena, Italy, which shows Phanes coming from an egg, surrounded by the twelve signs of the zodiac, in an image very similar to that at Newcastle. He is sometimes depicted as a man being born or reborn from a rock (the 'petra genetrix), typically with the snake Oroboros wrapped around it. It is commonly believed that the cave in Mithraism imagery represents the cosmos, and the rock is the cosmos seen from the outside; hence the description of this god as 'rising from the dead'. According to some accounts, Mithras died, was buried in a cavernous rock tomb, and was resurrected. Another more widely accepted interpretation takes its clue from the writer Porphyry, who recorded that the cave pictured in the tauroctony was intended to be "an image of the cosmos." According to this view, the cave depicted in that image may represent the "great cave" of the sky. This interpretation was supported by research by K. B. Stark in 1869, with astronomical support by Roger Beck (1984 and 1988), David Ulansey (1989) and Noel Swerdlow (1991). This interpretation is reinforced by the constant presence in Mithraic imagery of heavenly objects — such as stars, the moon, and the sun — and symbols for the signs of the Zodiac. One of the central motifs of Mithraism is the tauroctony, the myth of sacrifice by Mithra of a sacred bull created by the supreme deity Ahura Mazda, which Mithra stabs to death in the cave, having been instructed to do so by a crow, sent from Ahura Mazda. In this myth, from the body of the dying bull spring plants, animals, and all the beneficial things of the earth. It is thought that the bull represents the constellation of Taurus. However, in the period we are considering, the sun at the Vernal Equinox had left Taurus two thousand years before, and was in the process of moving from Aries to Pisces. In light of this interpretation, it has been suggested in recent times that the Mithraic religion is somehow connected to the end of the astrological "age of Taurus," and the beginning of the "age of Aries," which took place about the year 2000 BC. It has even been speculated that the religion may have originated at that time (although there is no record of it until the 2nd century BC). The identification of an "age" with a particular zodiac constellation is based on the sun's position during the vernal equinox. Before 2000 BC, the Sun could have been seen against the stars of the constellation of Taurus at the time of vernal equinox [had there been an eclipse]. Due to the precession of the equinoxes, on average every 2,160 years the Sun appears against the stars of a new constellation at vernal equinox. The current astrological age started when the equinox precessed into the constellation of Pisces, in about the year 150 BC, with the "Age of Aquarius" starting in AD 2600. Indeed, the constellations common in the sky from about 4000 BC to 2000 BC were Taurus the Bull, Canis Minor the Dog, Hydra the Snake, Corvus the Raven, and Scorpio the Scorpion, all of which may be identified in the fresco from Dura-Europos, a standard Hellenistic iconography (illustration, above right). Further support for this theory is the presence of a lion and a cup in some depictions of the tauroctony: indeed Leo (a lion) and Aquarius ("the cup-bearer") were the constellations seen as the northernmost (summer solstice) and southernmost (winter solstice) positions in the sky during the age of Taurus. The precession of the equinoxes was discovered, or at least publicized, by the Greek astronomer Hipparchus in the 2nd century BC. Whether the phenomenon was known by Mithraists previously is unknown. In any case, Mithras was presumed to be very powerful if he was able to rotate the heavens, and thus 'kill the bull' or displacing Taurus as the reigning image in the heavens. Some commentators surmise that the Mithraists worshipped Mithras as the mediator between Man and the supreme God of the upper and nether world. Other commentators, inspired by James Frazer's theories, have additionally labeled Mithras a mystery religion with a life-death-rebirth deity, comparable to Isis, the resurrected Jesus or the Persephone/Demeter cult of the Eleusinian Mysteries. Mithraism is generally considered to be of Persian origins, specifically an outgrowth of Zoroastrian culture, though not of Zoroaster's teachings. For Zoroaster was a monotheist, for whom Ahuramazda was the One god. Darius the Great was equally stringent in the official monotheism of his reign: no god but Ahuramazda is ever mentioned in any of the numerous inscriptions that survive of his reign (521–485 BC). "Artaxerxes the Great King, [...] says: [...] By the favor of Ahuramazda, Anahita, and Mithra, this palace I built. May Ahuramazda, Anahita, and Mithra protect me from all evil, and that which I have built may they not shatter nor harm." It is tempting to identify the Roman Mithras with the Persian Mithra, except that there is no known Persian legend or text about Mithra killing a bull or being associated with other animals. On the other hand, there is a story of Ahriman, the evil god in popular developments of Zoroastrianism, killing a bull. It is also hard to explain how the Sun-god Mithra would come to be worshipped in the windowless, cave-like mithraeum. A possible link between Persia and Rome, which could be the stage for these changes, may be the kingdoms of Parthia and Pontus in Asia Minor. Several of their kings were called Mithradates, meaning "given by Mithra", starting with Mithradates I of Parthia (died 138 BC). It would seem that, in those kingdoms, Mithra was a god whose power lent luster even to a king. And it was at Pergamum, in the 2nd century BC, that Greek sculptors started to produce bas-relief imagery of Mithra Taurocthonos, "Mithra the bull-slayer." Although the cult of Mithras never caught on in the Greek homeland, those sculptures may indicate the route between Persian Mithra and Roman Mithras. Around the first century AD, the Greek historian Plutarch wrote about pirates of Cilicia who practiced the Mithraic "secret rites" around 67 BC. Since Cilicia was the coastal province in the southeast of Anatolia, the Mithras mentioned by Plutarch may have been worship of the Persian god Mithra; or may have been associated with Ahriman, the Persian god who killed a bull. Mithraism arrived fully mature at Rome with the return of the legions from the east in the first century BC. As an action god of armies and the champion of heroes, he appealed to the professional Roman soldiers, who carried his cult to Iberia, Britain, the German frontiers and Dacia. The cult of Mithras began to attract attention at Rome about the end of the first century AD, perhaps in connection with the conquest of then-Zoroastrian Armenia. The earliest material evidence for the Roman worship of Mithras dates from that period, in a record of Roman soldiers who came from the military garrison at Carnuntum in the Roman province of Upper Pannonia (near the Danube River in modern Austria, near the Hungarian border). These soldiers fought against the Parthians and were involved in the suppression of the revolts in Jerusalem from 60 A.D. to about 70 A.D. When they returned home, they made Mithraic dedications, probably in the year 71 or 72. Statius mentions the typical Mithraic relief in his Thebaid (Book i. 719,720), around A. D. 80; Plutarch's Life of Pompey also makes it clear that the worship of Mithras was well known at that time. By A. D. 200, Mithraism had spread widely through the army, and also among traders and slaves. The German frontiers have yielded most of the archaeological evidence of its prosperity: small cult objects connected with Mithra turn up in archaeological digs from Romania to Hadrian's Wall. Sol Invictus on the reverse of this coin by usurper Victorinus. At Rome, the third century emperors encouraged Mithraism, because of the support which it afforded to the divine nature of monarchs. Mithras thus became the giver of authority and victory to the Imperial House. From the time of Commodus, who participated in its mysteries, its supporters were to be found in all classes. As would be expected, Mithraic ruins are also found in the port city of Ostia, and in Rome the capital, where as many as seven hundred mithraea may have existed (a dozen have been identified). Its importance at Rome may be judged from the abundance of monumental remains: more than 75 pieces of sculpture, 100 Mithraic inscriptions, and ruins of temples and shrines in all parts of the city and its suburbs. A well-preserved late 2nd century mithraeum, with its altar and built-in stone benches, originally built beneath a Roman house (as was a common practice), survives in the crypt over which has been built the Basilica of San Clemente, Rome. Worship of the sun (Sol) did exist within the indigenous Roman pantheon, as a minor part, and always as a pairing with the moon. However, in the East, there were many solar deities, including the Greek Helios, who was largely displaced by Apollo. By the 3rd century, the popular cults of Apollo and Mithras had started to merge into the syncretic cult known as Sol Invictus, and in 274 CE the emperor Aurelian (whose mother had been a priestess of the sun) made worship of Sol Invictus official. Subsequently Aurelian built a splendid new temple in Rome, and created a new body of priests to support it (pontifex solis invicti), attributing his victories in the East to Sol Invictus. But none of this affected the existing cult of Mithras, which remained a non-official cult. Some senators held positions in both cults. However, this period was also the beginning of the decline of Mithraism, as Dacia was lost to the empire, and invasions of the northern peoples resulted in the destruction of temples along a great stretch of frontier, the main stronghold of the cult. The spread of Christianity through the Empire, boosted by Constantine's tolerance of it from around 310 CE, also took its toll - particularly as Christianity admitted women while Mithraism did not, which obviously limited its potential for rapid growth. The reign of Julian, who attempted to restore the faith, and suppress Christianity, and the usurpation of Eugenius renewed the hopes of its devotees, but the decree secured by Theodosius in 394, totally forbidding non-Christian worship, may be considered the end of Mithraism's formal public existence. Mithraism still survived in certain cantons of the Alps into the 5th century, and clung to life with more tenacity in its Eastern homelands. Its eventual successor, as the carrier of Persian religion to the West, was Manichaeism, which competed strenuously with Christianity for the status of world-religion. There is much speculation that Christian beliefs were influenced by Mithraic belief. Ernest Renan, in The Origins of Christianity, promoted the idea that Mithraism was the prime competitor to Christianity in the second through the fourth century AD, although most scholars feel the written claims that the emperors Nero, Commodus, Septimius Severus, Caracalla, and the Tetrarchs were initiates are dubious at best, and there is no evidence that Mithraic worship was accorded any official status as a Roman cult. Except in its official form as 'Sol Invictus,' the first universal religion of the Greco Roman world. Bull and cave themes are found in Christian shrines dedicated to the archangel Michael, who, after the officialization of Christianity, became the patron "Saint" of soldiers. Many of those shrines were converted Mithraea, for instance the sacred cavern at Monte Gargano in Apulia, refounded in 493. It is hard to avoid the conclusion that the Mithras cult was transferred to the previously unvenerated archangel. Bull and crypt are linked in the Christian saint Saturnin (frequently "Sernin" or "Saturninus") of Toulouse, France. The Mithraeum is retained as a crypt under his earliest church, evocatively named "Notre-Dame du Taur." It has also been speculated that the ancient Orobouros of Mithraism (the encircling serpent about to bite its own tail) was adapted for a Christian symbol of the limited confines of time and space. The snake around a rock also is reminscent of the Midgard serpent, Jörmungandr, who was said to surround Midgard (the Earth) according to Norse traditions. Christians would argue that because the Gospels were written mostly before 100 and that since little is known of Roman Mithraism until after 100 that it is not plausible to say that Christianity borrowed any of its doctrines from Mithraism; some Christians have suggested that Mithraism may have borrowed some elements from Christianity. Other, non-Christian scholars disagree on both the dating of the gospels and with the conclusions made. The First International Congress of Mithraic Studies was held in 1971 at Manchester, England. Franz Cumont (1868 - 1947) was the main proponent of the theory that Mithraism came originally from Persia. Cumont's student, Maarten J. Vermaseren, author of Mithras, the Secret God (1963), was very active in translating Mithraic inscriptions. Walter Burkert, Ancient Mystery Cults, Harvard University Press, 1987. A book, based on his Jackson Lectures at Harvard University in 1982, dispels some misconceptions and stereotypes. The Mysteries of Mithra 1903 English translation, complete, of Franz Cumont's book. David Ulansey, The Cosmic Mysteries of Mithras An article published in Biblical Archaeology Review in which David Ulansey summarized his book The Origins of the Mithraic Mysteries (Oxford, 1989). Ronald Nash, "Was the New Testament Influenced by Pagan Religions?" An article by a reputable scholar arguing that pagan religions (including Mithraism) did not influence the new Testament. David Fingrut, "Mithraism: The Legacy of the Roman Empire's Final Pagan State Religion" A high-school level web page, but good summary of Cumont. Mithraism and Precession A web page critical of Ulansey's theory regarding Mithraism and the Age of Taurus; the author's credentials are not given, and references to scholarly literature are not provided. Abstract from M.J. Vermaseren, Mithras, the Secret God, 1963 Author's credentials vague, but good abstract of Vermaseren's book. 3rd Century Mithraeum in the Circus Maximus, Rome: Good illustrated introductory article. Mithraeum at Riegel, Baden-Wurtemburg: plan and photos (French). Museum of Dieburg, Germany, displays finds from a mithraeum, including ceramics used in the service. The museum of Hanau, Germany displays a reconstruction of a mithraeum. The museum at the University of Newcastle displays findings from the three sites along Hadrian's Wall and recreates a mithraeum. Church of St. Clement in Rome has a preserved mithraeum with the altarpiece still intact. Ostia Antica, the port of Rome, where the remains of 17 mithraea have been found so far; one of them is substantial. This page was last modified 20:20, 4 October 2005.